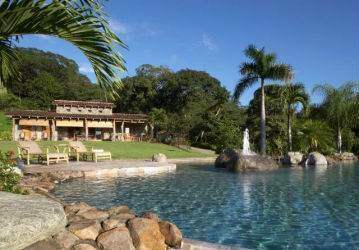 Beautiful Expansive Estate on 82 hectares (over 202 acres) of property. The home is made of stone, with a clay tile roof, keeping it cool all year long. The main home has 3 bdrms & 2 baths, is over 200m2 and can be easily extended. The large office with floor to ceiling windows is 60m2 and could easily be converted into another small home. There is also a 100m2 warehouse, a 40m2 Guardian house, a carport and an 18m2 kennel. The property has 20 hect of Braquira pasture for cattle, it is divided in five fields: 1 hect for horses, all of them with watering troughs and feeders. It has two hect planted with five types of ornamental palm trees. This Estate would make an Amazing Private Retreat.